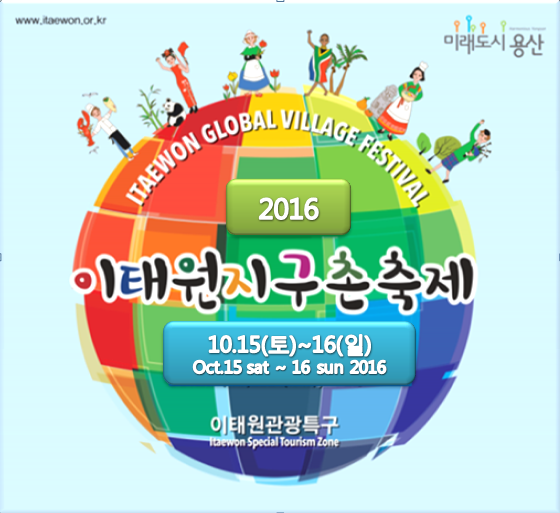 The '2016 ITAEWON Global Village Festival' is a chance to enjoy your time in a more "international" manner! Foods and accessories from all parts of the globe are all setting up booth in the streets of Itaewon for us to enjoy! DJ's and idols will also be joining in on the festival to entertain you while you're here! Fringe bands will be given a stage to perform and you can be the first to hear them before they become the next big thing. Come with family or friends and enjoy your time with us at this wonderful festival on October 15th to October 16th! We look forward to seeing you all there! See you in the streets of Itaewon! The 2016 Itaewon Global Village Festival promises to be even more exciting this year as the best global village festival in the YONGSAN district! The festival offers a chance to dine on international delights from around the world! You can also enjoy our time dancing till the sun sets to the music played by some of the best DJ's in Korea! Enjoy music put on by K-POP concert and a world traditional fashion show. There will be a variety of street performances and a spectacular musical parade displaying the cultural diversity of the international Itaewon community. This festival offers a chance to share the culture of your country to the rest of the world in a tasty or spectacular manner(Or both! ).